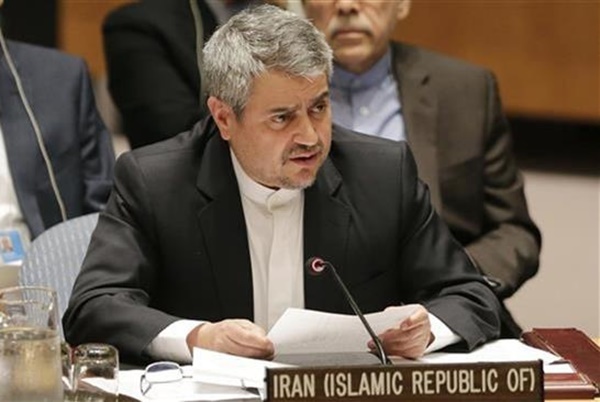 Iran’s envoy to the United Nations has slammed Washington’s ‘morally wrong’ measures against other countries, saying that unilateral sanctions amount to collective punishment and violate basic human rights. “The morally wrong and ethically unjustified unilateral measures not only defy the rule of law at the international level but also infringe upon the right to development and lead to the violation of basic human rights,” Khoshroo said. He made the remarks in an address to the Sixth Committee of the 73rd Session of the United Nations General Assembly on ‘Report of the Special Committee on the Charter of the United Nations and on the Strengthening of the Role of the Organization’. “Coercive measures often lead to collective punishment of innocent civilians and violation of human rights,” he noted, blasting the US’ measures against the Islamic Republic, which have hit innocent civilians on the contrary to what American officials claim. US President Donald Trump announced in May that Washington was pulling out of the nuclear agreement which lifted nuclear-related sanctions against Iran in exchange for restrictions on Tehran’s nuclear program. Khoshroo also took a swipe at Washington’s use of threats against other countries as a tool of foreign policy, saying that the manifestation of the ‘surprising’ trend can even be traced in the UN. “Threatening to cut financial aid to those countries who voted in favor of a UN resolution or warning them against the possible consequences of their vote in the General Assembly by saying ‘the US taking the names’ is just one example of visible offense to the UN principles,” he said. “One thing is clear. This trend is weakening the organization, not strengthening it, and runs counter to the very objective of the Charter Committee establishment,” Khoshroo warned.